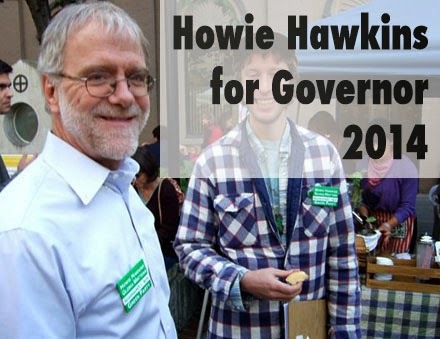 Howie Hawkins was the Green candidate for NY Governor in 2010. 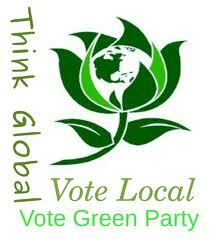 He is seeking the Green nomination for NY Governor in 2014. Andrew Cuomo’s State of the State address highlighted tokens of social liberalism for his working and middle class voter base. But we cannot let that divert us from his very conservative class agenda for his rich donor base. Cuomo touts prosperity but practices austerity. The tax package at the center of Cuomo’s 2014 agenda is simply reactionary corporate welfare. Working and middle class New Yorkers will pay dearly for the tax cuts and tax-free zones for business. They will pay in the form of cuts to local government services and schools and in reduced home rule. The local cuts will be forced by the state from the top down on local governments by state mandates to stay within the 2 percent property tax cap and to consolidate services in order to qualify residents of a municipality for property tax relief in the form income tax credits. The circuit breaker for renters is a progressive reform for worth supporting. But the cuts in the estate tax are regressive when wealth continues to concentrate at the top. The Green Party calls for progressive property tax relief program based shifting more of the tax burden for both local and state government away from regressive sales and property taxes and on to more progressive personal and business income taxes. Combined with a restoration of state revenue sharing with local governments back toward the once-enacted 8% of state revenues and a restoration of the once-enacted Foundation Aid Formula for fiscal equity in school funding, progressive tax reform can raise generous revenues for public services and schools more fairly. State revenue sharing will afford local government’s the power to decide for themselves what mix of tax relief and spending on schools and services best meets their local needs. Scores of local governments and school districts are headed for insolvency and a state takeover by Financial and Educational Control Boards. My city of Syracuse will have exhausted its reserves by the end of the next fiscal year unless state revenue sharing is increased. Revenue sharing was enacted in the 1970s to pay for state mandates on local government. This state funding is particularly crucial to property-poor but service-rich cities and towns like Syracuse whose property-tax exempt governmental, educational, and health care institutions are the major employers and economic engines of their regions. But the once promised 8% of state revenues has been cut to less than 1%, forcing localities to raise regressive local sales and property taxes to pay for what used to be covered by state sharing of revenues from progressive income taxes. Cuomo’s fiscal program freezes the existing level of revenue sharing for the next four years. Meanwhile, the state is now $8.9 billion behind on the school aid promised when the Foundation Aid Formula for fiscal equity was enacted in 2007. Cuomo’s fiscal program is setting up many of our local governments and school districts for fiscal failure. The Greens also believe that New York City should have home rule on their city income tax rates and the freedom to raise taxes on the very rich to pay for universal pre-K. The theory behind Cuomo’s corporate welfare tax program is that by giving the rich more money, they will invest, create good jobs, and the benefits will trickle down. New York and the United States have been practicing trickle down economics for more than three decades. The result has been a radical redistribution of wealth and income from working people to the very rich. The incomes and living standards of the working and middle classes have declined under this economic policy. In New York, inequality is the most extreme of any state, with the share of income going to the wealthiest 1% more than tripling from 10% from in 1980 to 30-35% in the years since 2007. The Green agenda for reducing inequality includes progressive tax reform and revenue sharing, but it would focus more on “predistribution” than redistribution. The purpose of progressive taxation is to fairly fund public services. It can only slightly ameliorate the inequality that is generated at the point of production. In order to really create a fairer distribution of income, wealth, and power, we must focus on distribution at the point of production, within businesses, where income inequality is first generated. The Greens support progressive labor market reforms, starting with a $15 minimum wage indexed to inflation. 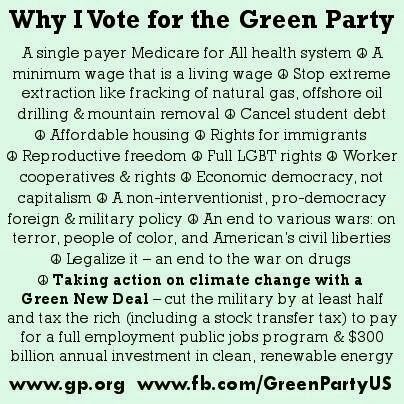 Greens support labor law reform that enable workers to democratically organize unions and a full employment program featuring public jobs to cover the shortfall in private jobs and meet critical needs for human services, affordable housing, mass transit, and clean energy. The Greens also call for a business development program that the prioritizes the development of worker cooperatives instead of corporate welfare giveaways. In worker cooperatives, income disparities among worker-owners are much smaller than in traditional capitalist firms. 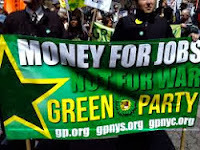 The Greens also call for democratic public utilities in banking, energy, and health care that operate at cost for public benefit, not for private profit. Cuomo’s small tax credits for working people next to big tax cuts for business will do nothing to redress the growing inequality in New York State. We need a program of economic democracy where workers receive the full fruits of their labor at the point of production. Even with Cuomo’s social liberalism, we see the same pattern of talking left, but walking right. Cuomo failed to use his bully pulpit last year to pressure the state Senate to adopt the full Women’s Agenda, including the abortion rights reforms to bring New York State law into line with Roe v. Wade. Cuomo has promised to push for a public campaign finance system in every one of his State of the State addresses. But he has never put his political muscle behind his promise. The result has been retrenchment. The state legislature had for a decade before the current session bills for full public campaign financing like Arizona and Maine have. Now there are no bills for full public campaign financing. What is now on the agenda is a partial public campaign finance bills based on limited public matching funds combined with unlimited private campaign funding. That “reform” would only add public funding to a privatized system of campaign financing dominated by the incumbents. Now Cuomo is gesturing to try and catch up with the nationwide marijuana reform movement, but his proposal is ill-considered. Cuomo proposes an executive order based on an outdated 1980 law for medical marijuana, which relies on the uncertain quality of police inventories of marijuana from drug busts and requires dosages from leaves only when oil is indicated for many medical applications. He proposes the program be limited to 20 hospitals without any guarantee that the federal government will approve this program, which will likely make hospitals reluctant to risk their qualification to receive Medicare and many other streams of federal funding by incorporating Cuomo’s poorly conceived medical marijuana program. Instead of supporting the well-vetted, up-to-date medical marijuana legislation sponsored by Assemblymember Gottfried and Senator Savino, Cuomo intends to bypass the democratic process in the legislature to push an inferior program by executive fiat. Meanwhile, Cuomo continues the war on drugs and mass incarceration. It is time for New York legalize, regulate, and tax marijuana, as Colorado and Washington state have done. Tens of thousands of New Yorker’s lives have been destroyed by convictions for nonviolent marijuana offenses, which has had a devastating impact on their families and the communities of color that have been targeted in the drug war. Drug abuse should be treated as health problem, not a criminal problem. We should provide universal access to drug rehab through a cost-efficient, single-payer, public health plan that provides all medically necessary services to all New Yorkers. Cuomo may be a party Democrat, but he is not a small-d democrat. Cuomo’s agenda is not only reactionary on economics. It is fundamentally anti-democratic, from its top down imposition of fiscal austerity on local governments and school districts to his attempt to bypass the legislature on marijuana reform. Perhaps nothing demonstrates Cuomo’s anti-democratic politics more than his disenfranchisement and denial of legislative representation to over 1 million New Yorkers by his refusal to call special elections to fill nine vacant seats in the state Assembly and Senate before the 2014 general election. Cuomo is no better in this respect than the hard right Republicans who have been enacting photo ID and other voter suppression laws around the United States. Cuomo is pushing his decision on fracking off until after the 2014 gubernatorial election when, as he turns to his presidential ambitions, he can join the pro-fracking consensus of the national Democratic leadership. The Greens demand a ban on fracking now, not after the election. The climate cannot afford more carbon and methane from fracked gas, or to divert any more social resources to fossil fuel development when they are needed for energy conservation, efficiency, and clean renewables. Cuomo touts his New York Sun Initiative and Green Bank “public-private partnership.” But these programs fall far short of what climate science now demands of New York to pull its weight in the energy transition we need to avert climate catastrophe: a rapid 20-year transition to 100% clean energy. New York needs a Green New Deal, the centerpiece of which must be putting New Yorkers back to work in a crash program building a climate-safe and sustainable clean energy system.